Yesterday, due to the swell of the crowd at the construction gate at Camp Schwab, the government cancelled the usual convoy of dump trucks delivering huge rocks that are placed in Oura Bay. So about 50 people, including our VFP delegation, were taken to a Nago City port where the government has been loading rocks onto a ship that then takes them directly to Oura Bay in order to circumvent the gate blockades. Our job yesterday at the port was to stand in front of dump trucks as they drove up to unload their rock cargo which was then scooped up and placed inside the ship. It takes 170 truck loads to fill a ship with rocks. There are presently two ships making this voyage each day with two more soon to join this effort. Usually about 10 protesters are at the port to symbolically interfere with the process. Since we had 50 of us there we were actually able to 'significantly slow them down' according to one of the protest leaders. Just across the highway from the port is a mountain that is being blasted apart for the rocks which are then trucked to the port area. At the current pace of construction we were told it will take another 15-20 years to complete the twin-runway airfield on top of Oura Bay. So this is going to be a protracted struggle. Another thing we heard last night was about the concerted effort by US-Japan to sell the base expansion at Camp Schwab to the public. US military troops do things like organize baseball games for the public and teach English in local schools as a way to normalize the US military presence on the island. A local corporate leader and military supporter, a likely candidate for governor in the next election, sponsored an event that drew 250,000 mostly young people to hear from actors, musicians, and comedians flown in from mainland Japan. 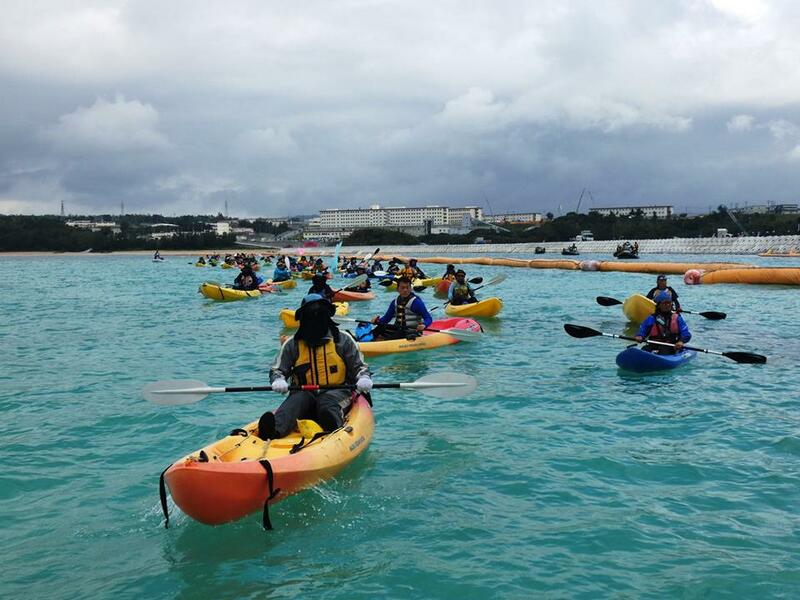 This effort is intended to de-politicize the next generation of Okinawans. 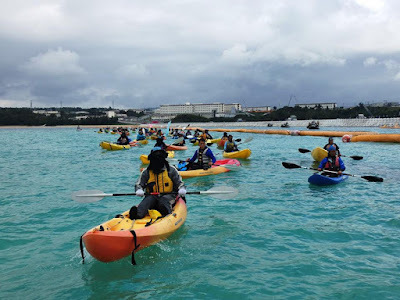 The US’s National Endowment for Democracy (a CIA front) is believed to be funding Okinawan right-wing NGO’s to assist in the process of destabilizing and impeding the anti-bases movement on the island. The NED is well-known for its similar operations around the world – one of the more recent examples was their key role in the 2014 coup in Ukraine. The anti-base movement obviously has a hard time competing with this kind of corporate/government money and power. Currently there is a big debate inside the movement about the best ways to proceed under these trying circumstances. One thing they need is greater international solidarity. Peaceniks around the planet could help by sharing information about the Okinawan movement and organizing small delegations to come to the island in order to learn more about the issues here and to join the protests at the many US bases. 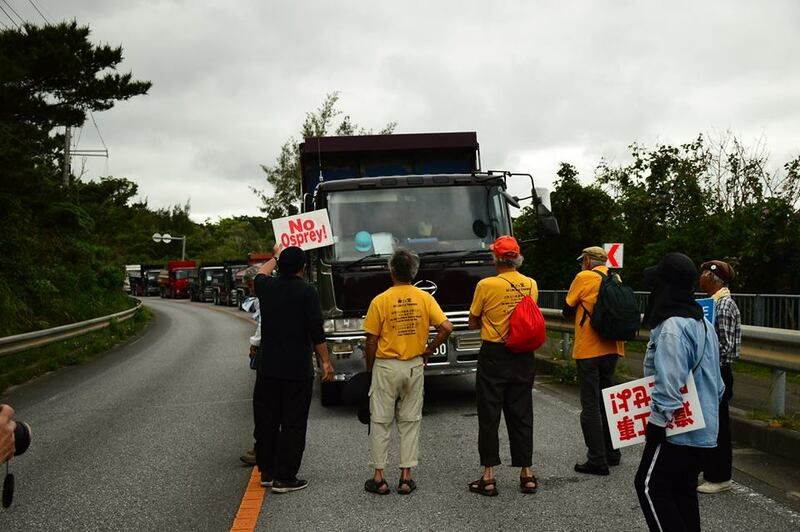 It is in every ones interest to support movements like the one in Okinawa. The more we can be in planetary solidarity with one another the better chance we have to slow down and stop the growing US-NATO military juggernaut which continually pushes us toward more war. Today will be the biggest day of protest at Camp Schwab (that sits on pristine Oura Bay) during this week called ‘500’. The goal was to have 500 people come each day to join construction gate blockades outside US Marine Base Camp Schwab where twin-runways are being built on top of the bay under US military orders. Millions of truckloads of huge rocks and gravel are brought each day and are being dumped in the bay. It’s an insane project and the people are angry and heartbroken as they know the beautiful nature of their sacred bay will be forever changed. 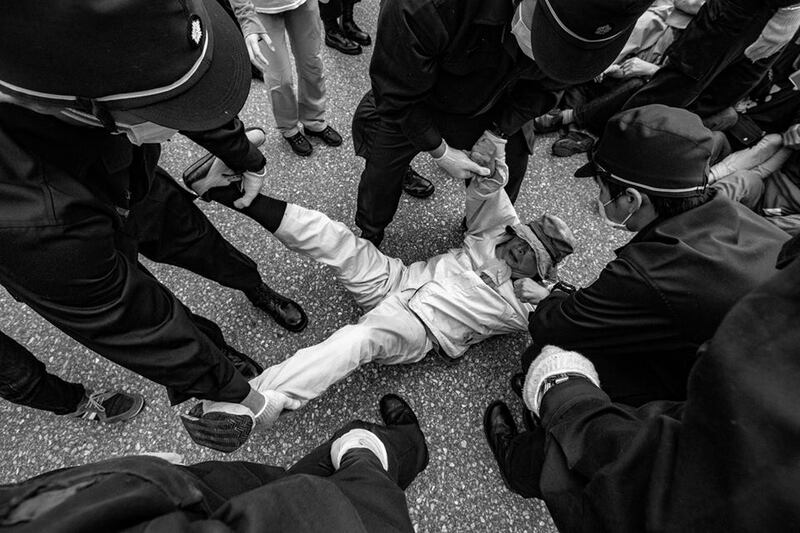 April 28, 1951 is known in Okinawa as the ‘Day of Humiliation’. It is the day that following the US military victory over Japan, and subsequent occupation of Okinawa and Japan, the Japanese were given their independence. 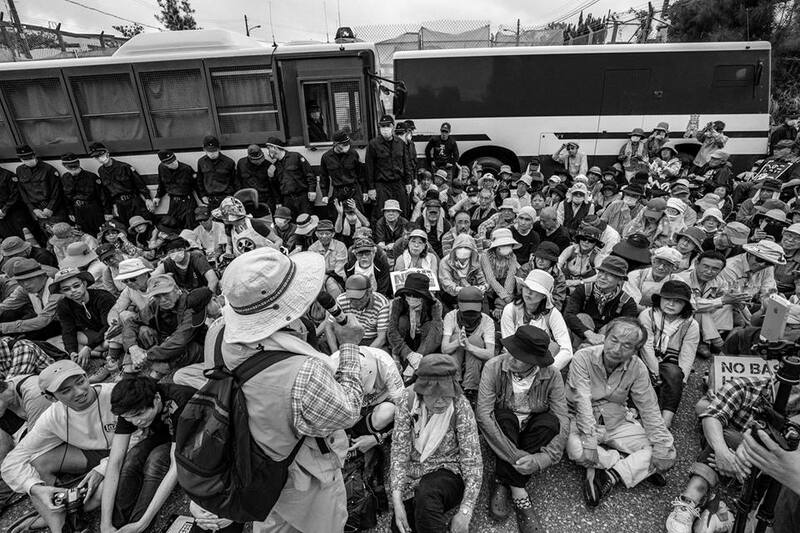 But for the Okinawans April 28 was the day that their island was officially placed under US military occupation. And it’s essentially been that way ever since. Okinawa was once called the Ryukyu Kingdom, a peaceful and independent nation. But following their occupation by imperial Japan their kingdom was destroyed and they became subjects of the fascist forces. Japan was defeated in the Battle of Okinawa where about 120,000 civilians (one-quarter of the population at the time) were killed in 1945 but at least the survivors thought with the US victory they would again be given the chance to recover their beloved Ryukyu Kingdom and own language. With US occupation it was not to be. 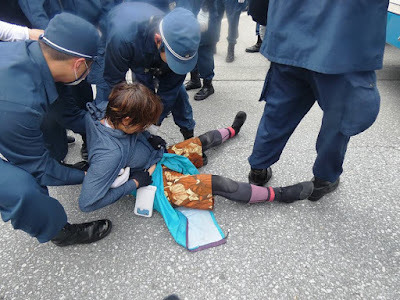 The US did allow Okinawa to be reverted back to Japan in 1972 but US military forces have remained firmly embedded and in control on the island since 1945 – now 73 years of continual military occupation. 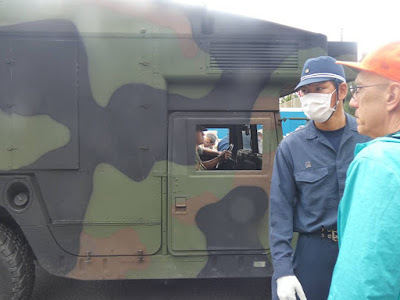 For all intents and purposes Okinawans are still not free – one military occupier replaced another – their true independence still awaits. This will be our last day outside the gates of the hyper-expanding Camp Schwab as Washington and Tokyo ramp up their military escalation aimed at China and Russia. These two former enemies – the US and fascist Japan – now stand united as they destabilize the region on behalf of imperial corporate interests. Dud Hendrick, Tarak Kauff, and I will return on a 4:00 pm bus to a hotel in Naha City for the night and on Sunday will board our respective planes for our next leg of this journey. Dud and Tarak will return home and I will head to Taiwan for a couple days visit with my son Julian who has been teaching there for the past few years. We are extremely grateful to all of our hosts and many new friends for their beautiful spirit and generous hearts during this remarkable week of determined protests. It’s been inspiring for us to stand and sit with such dedicated peace people who believe that we must challenge the dangerous path to war in our own communities where these manifestations of violence are present. No matter whether they are military bases or military production facilities we must bring this spirit of non-violence to challenge the push for endless war that is currently chewing up the resources of the world on behalf of corporate interests. 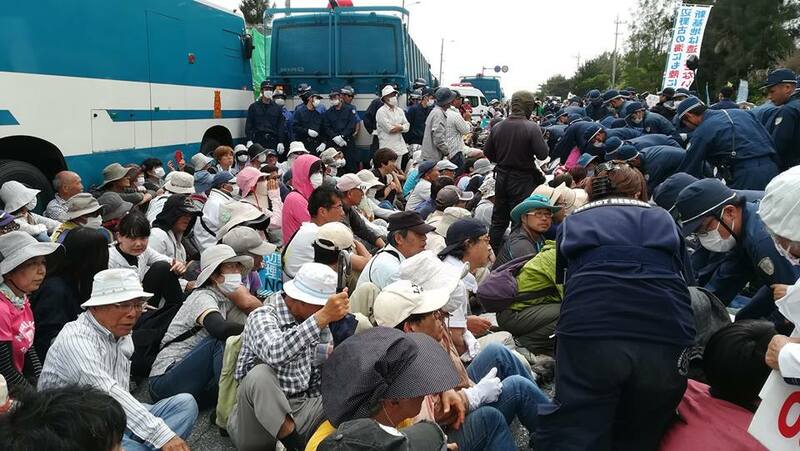 We all have much to learn from places like Okinawa and Jeju Island, South Korea where indigenous people continue to struggle against the dark forces of our time. In that struggle they refuse to surrender their lands, their natural beauty and their souls to the US military colonization. They sing, dance, shout, and get dragged away from gates as they try to protect the future generations from the scourge of war that has been made real on their lands in years past. 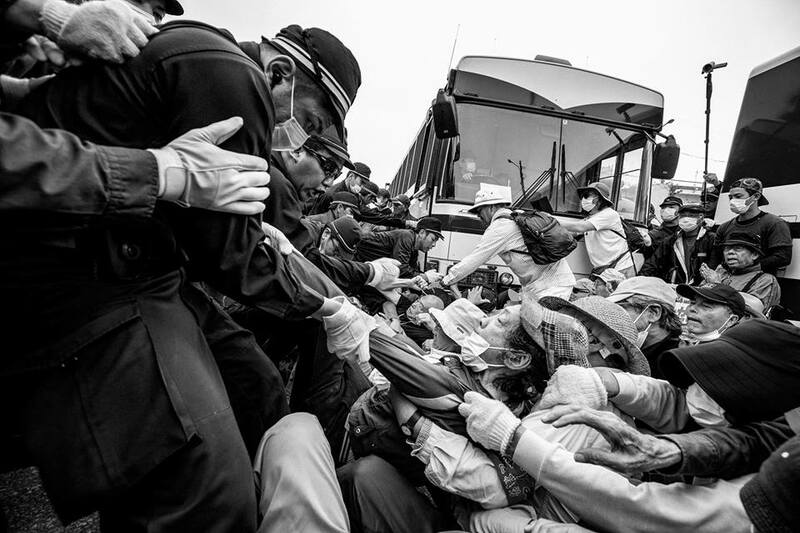 They are not protesting for some theoretical peace – these people know war and don’t want to ever go there again. A review of status of forces agreements (SOFA) between the United States and Japan, Germany, and Italy, respectively, by the Okinawa Prefectural Government has turned up startling facts that indicate how little Japan has settled for in its accord with the U.S.
Due to a series of incidents involving United States military aircraft in Japan, the Japan-U.S. Status of Forces Agreement (SOFA), which stipulates the rights of U.S. forces based in Japan, has come under renewed scrutiny. The Okinawa Prefectural Government, which seeks a renegotiation of the agreement as it serves as a basis for the U.S. military to flaunt its privileged position, investigated SOFAs between the U.S. and Germany and Italy, respectively -- the two other former Axis powers aside from Japan, who lost in World War II. The US military has occupied Okinawa for the last 73 years and currently controls about 20% of the island for the Pentagon’s 32 bases. Back in the early 1980’s then Japanese Prime Minister Nakasone used to say that Japan was “an unsinkable aircraft carrier for the US”. He was essentially talking about Okinawa – the Japanese mainland has some US bases but not nearly as many as here. Most Japanese on the mainland don’t feel the heavy military boot print the same way that the Okinawan people do. The situation on Okinawa is made particularly dangerous because of the aggressive actions in the region by Washington. As North and South Korean leaders prepare to discuss peace on the Korean peninsula Washington is doing its best to sabotage those talks. 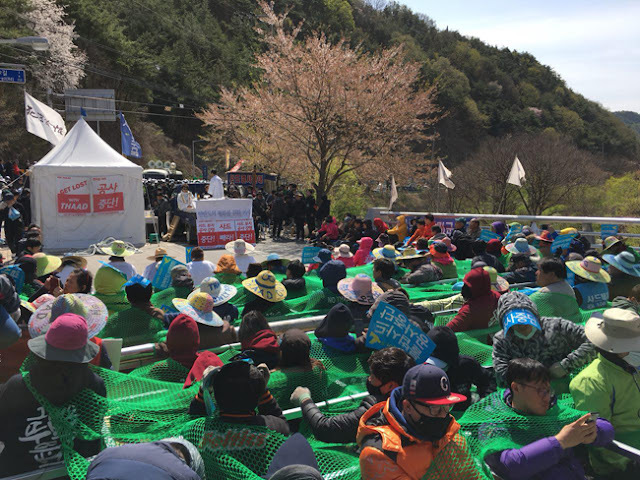 One example is the forced April 23 deployment of even more THAAD (Terminal High Altitude Area Defense) missile defense system components in Soseong-ri (melon farming community) in South Korea. 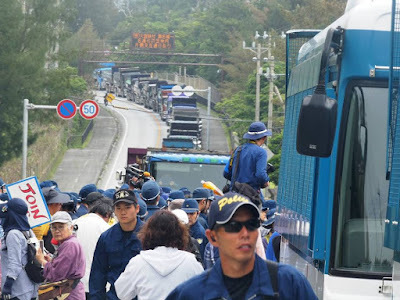 Hundreds of farmers and their supporters blocked the road for 11 hours as the US Army attempted to aggravate the already tense situation on the Korean peninsula by deploying these systems that are key elements in Pentagon first-strike attack planning. The THAAD radar gives the US the capability to detect Chinese and Russian missiles giving the Pentagon an advantage in a war with those two nations. It seems clear to me that Washington is not willing to make any peaceful concessions to North Korea in order to come to any agreement. The US also views the Korean peninsula as another “unsinkable aircraft carrier” for Pentagon military installations. Similarly, the recently completed Navy base on Jeju Island, South Korea in Gangjeong village has already seen a series of US and NATO member Navy warships porting at the base. The US has been pressuring the South Korean government to sign agreements that would allow NATO member warships to permanently dock on Jeju Island. This indicates that the US views Jeju as a strategic port in the current ‘pivot’ of US-NATO into the Asia-Pacific region to encircle China and Russia. April 28, 2018 will mark the anniversary of 4,000 consecutive days of courageous people's struggle against the US navy base in Gangjeong. If the US truly intended to offer a friendly and peaceful hand to North Korea (as it hypocritically demands that they dismantle their nuclear weapons program) then the Pentagon would not have just days ago launched a Minuteman III nuclear capable-missile from Vandenberg Air Force Base in California. The missile was fired into the Pacific where it landed at its target at Kwajalein Atoll in the Marshall Islands. The message to China, Russia and North Korea is clear – ‘We can launch nuclear missiles anytime we wish but the rest of you better not try. We are the big dogs here and intend to control the Asia-Pacific region – challenge us at your own peril’. Also, in recent days US-NATO military ‘advisers’ have been seen in Ukraine where they are training and equipping the Army of the puppet government that was installed in Kiev following the CIA orchestrated coup d’etat in 2014. Since that time the right-wing government now under US-NATO control has continuously attacked their Russian speaking fellow citizens living in the eastern region of the country (called the Donbass) right along the Russian border. By creating chaos and instability there the US-NATO justify expanding their own military operations near Russia – something that was totally unthinkable during the Cold War. In those fragile times if the US-NATO had tried to do what they are doing today it would have led to nuclear war with the former Soviet Union. This story is not reported by the mainstream media. We can clearly see that Okinawa and South Korea would be prime targets in a US instigated war with China and Russia. I have no doubt that Washington-London-Paris-Brussels are doing everything possible to prod and poke Moscow and Beijing. The message is you either submit to western control or you face this growing military threat of US-NATO ‘full spectrum dominance’. Russia and China have repeatedly been saying ‘We do not want war but we are not going to get on our knees. We’ve seen what you’ve done with your chaos creation in Yugoslavia, Iraq, Afghanistan, Libya and Syria and are not going to allow this to continue.’ These dangerous and destabilizing provocations could lead to World War III. Now is the time for peace loving people around the world to resist the US-NATO imperial project. We are staying at a rustic Inn near Camp Schwab – in the countryside where local people have small vegetable plots. Dud Hendrick, Tarak Kauff, and I have been sleeping on the floor with thin pads underneath us. Outside there are lush Japanese-style gardens and the owner provides us an ample breakfast of salad, soup, and thick bread with pizza sauce and cheese. The showers feel good each morning after the previous day being outside in the mostly mid-70-degree temperatures. Last night the three of us from Veterans For Peace (VFP) were invited to attend a BBQ at a nearby covered pavilion. The food and beer were ample as was the conversation. I sat with two people from the Japanese mainland and they were particularly interested in my observations about their current government. Do you think the Shinzo Abe administration in Tokyo is an independent government or is it a client state under the control of Washington? I suggested that Abe’s government is willingly a junior partner in the current US imperial operation. They nodded affirmatively. Abe’s grandfather was in the Japanese imperial war cabinet. The Chinese, who were brutally invaded during WW II by fascist Japan, called him a ‘Class A’ war criminal. Abe’s has been doing everything possible to rid Japan of its Constitution’s Article 9 which rules out offensive military operations. Abe and Trump seem to be getting along splendidly these days. NATO has been expanding operations into the Asia-Pacific in recent years trying to turn its ‘area of responsibility’ into a global force for western corporate interests. The Japanese government has eagerly signed onto this expanding role as a NATO ‘partner’ as did South Korea, Australia, New Zealand, and Singapore. Thus, NATO now has given itself license to intervene where ever it deems necessary. The ultimate goal is to have an expanding NATO circumvent the authority of the United Nations by claiming it is a true global alliance – I call it the ‘coalition of the killing’. Yesterday afternoon during the second construction gate blockade we walked about a half-mile in the direction of the coming dump trucks (filled with huge rocks and gravel) and joined with others who stood in front of the trucks as they waited to enter Camp Schwab after the gates were cleared of those sitting to block the entry way. Heading away from the gate, and toward the long line of waiting trucks, was a good strategy because the police were for the most part clustered around the gate where they dragged people into the temporary cages. We were able to slow the dump truck convoy down by at least an hour because it took that long for the police to react to this strategy. As the police would approach us and push us away from the front of one truck, we’d just move to the next one and on it went. Eventually I was grabbed by two policemen, one who held on to the back of my pants, as they forcefully walked me into a second make-shift cage they had created just for those of us who were working the line of waiting trucks. 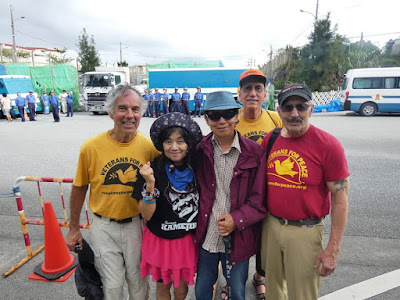 Once the blockade was over we ran into our Okinawan friend Sunshine (aptly named for her constant big smile and warm demeanor) who told us they had 83 kayaks earlier in the day in the Oura Bay action and she had been able to steer her tiny peace vessel underneath a crane out in the water which forced it to suspend its destructive operations for some time. So, between the activists on the sea and the land construction operations were again slowed down. Each moment of delay becomes breathing space to further build the international movement to stop this insane rush toward war that the US-NATO military alliance is aiming at China, North Korea and Russia. We each can do something every day to help this cause – discover your particular area of skill or interest and pour your passion for our Mother Earth into the work and help protect the future generations and our relations in the natural world. This is the message that is being conveyed during this intense and wonderful week of actions to protect Oura Bay. These protests have been happening daily for the last 13 years at Camp Schwab and are only going to grow as more people globally learn about them.